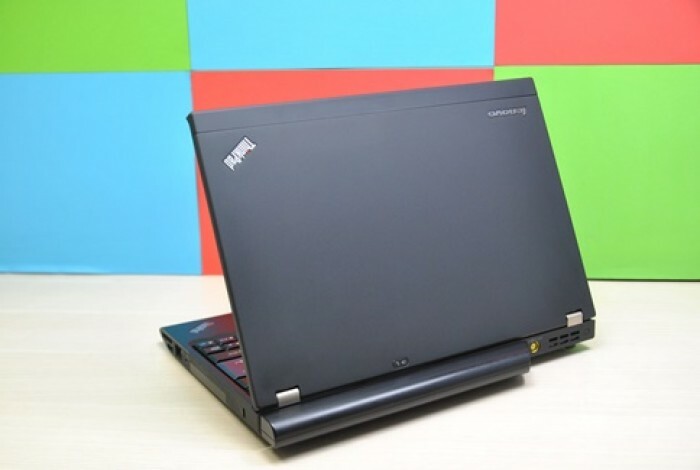 A Long bán Laptop Lenovo Thinkpad cũ X220 12 inch I5-2520M giá rẻ HCM. Cấu hình X220 I5-2520M, Ram 4G, SSD 128G, màn hình 12 inch sáng đẹp, bảo hành 3 tháng. 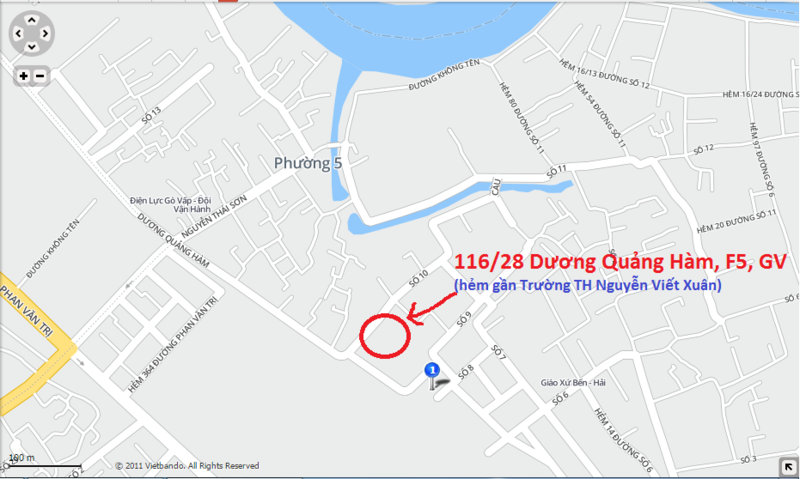 Hàng xách tay - nhập khẩu tình trạng còn sử dụng tốt. Màn hình 12 inch - nhỏ, gọn, bỏ vừa cốp xe. Chạy nhanh, ổn định và cực kỳ mát. 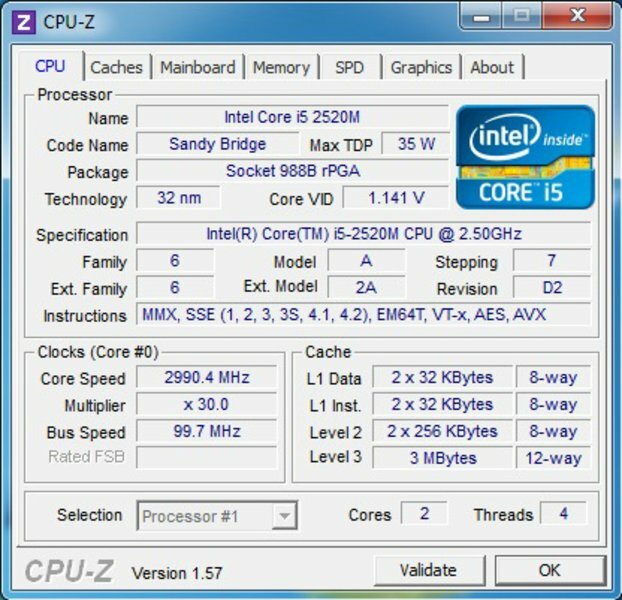 CPU I5-2520M xử lý các tác vụ nhanh chóng. VGA Intel HD Graphics 3000 X220 cũ sử dụng các ứng dụng đồ họa được. Lenovo”s ThinkPad notebooks are a must for any self-respecting businessman. The company has proven time and again that it can design and create laptops which fulfill the needs of on-the-go professionals, and, as such, it is not surprising that many large corporations, as well as private businesses, use ThinkPad models for work. Lenovo”s new model, the X220, has stirred up quite a bit of excitement thanks to the available IPS display. This is a significant addition as usually ThinkPad laptops have displays which are weak in contrast and have poor color depth. That”s not the only improvement: Lenovo has equipped it”s latest model with top-of-the-line hardware. So the X220 is available with an Intel Core i7-2620M CPU, USB 3.0 interface, internal UMTS, mSata SSD, and a long 23 hour battery life. In short, a dream comes true for professionals who demand performance...well it would be, if Lenovo could actually fit all those components into the ThinkPad X220. Sadly, the buyer will have to make a few compromises. Customers will have to choose between an internal UMTS module or an mSata SSD, and the extremely fast USB 3.0 is only offered with the Core i7 models. The low weight of 1.3 kg will also require the sacrifice of the large capacity battery which delivers such incredibly long battery life. The prices for the X220 start from 950 Euros (650,- Euro EDU) and go up to 2300 Euros (Core i7, SSD). The laptop can be configured by the buyer in Lenovo”s "Online shop", where the basic configuration costs is 1150 Euros. The IPS display requires an additional 40 Euros. Our test model is configured with hardware which would suit students better than professionals. This is due to the fact that at the start of our testing there were no regular models which had the IPS display. As such, our test model is equipped with an Intel Core i5-2520, 4 GB DDR3 RAM, a 320 GB hard disk, the IPS display, and a 63 Wh battery. The price of a similar configuration in the Online Store currently would be around 1400 Euros. 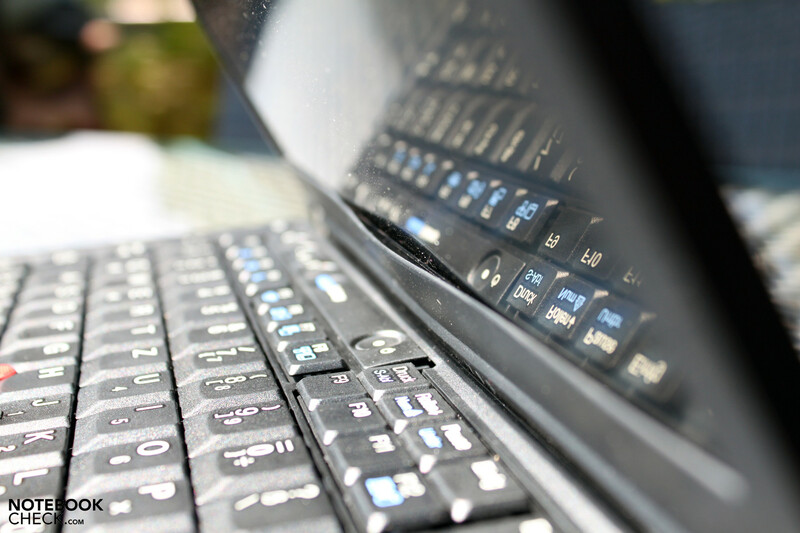 The rough, black and grey synthetic material surface is standard for ThinkPad models. These professional notebooks do not sport any glossy surfaces, chrome plating or distracting designs. The few features which stand out, such as the big metal hinges, which connect the display with the base unit, or the red "TrackPoint", placed in the middle of the keyboard, fit into the modest design well. 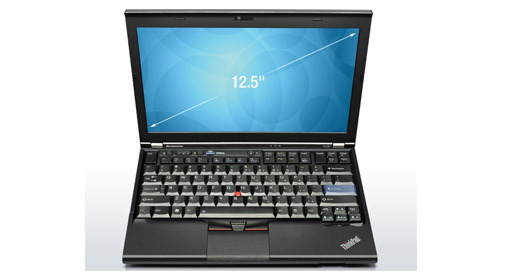 ThinkPad models are extremely conservative and usually have a very plain exterior. This trend is noticeable in the X220 as well. After all, a simple design is something most businessmen and professionals value very highly in a business notebook. Looks are not everything. Lenovo knows that the quality of the workmanship and the material used are equally important. Thankfully, ThinkPads have enjoyed a good reputation since the IBM times thanks to their attention to detail. The X220 offers a resistant chassis, which has an above-average resistance (supposedly tested by Lenovo MIL-SPEC). The bottom of the notebook as well as the hand-rest regions are also very good. The battery sits securely in its slot, and even the display and its hinges leave no room for critique. The overall stable display does not allow any alterations to the displayed picture regardless of how much pressure is applied to the display borders and the display case. Still the ThinkPad X220 is not perfect. 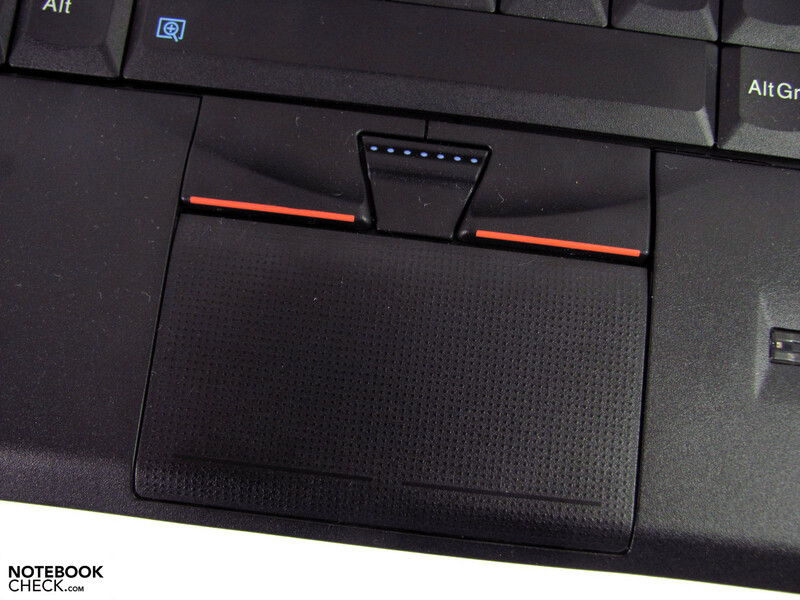 The hand-rest regions above the ExpressCard slot can be bent inwards slightly under medium pressure. The ThinkVantage bar is a bit wobbly and the bottom display border is (put in a nice way) quite "flexible". These are minor critiques but they can prove to be annoying on a long-term basis. For example, the thin display border material is prone to heating up quickly when the laptop is out in the sun. This leads to an ugly, if harmless, bulge in the material. When the laptop cools down, this bulge disappears almost completely. Still this defect will not inspire confidence in the user. Picking a good spot to sit and avoiding direct sunlight will ensure that this does not happen. The somewhat weak material quality is probably due to a compromise users have to make to enjoy the benefits of the low weight. The weight of our test model lies around 1.54 kg, of which 330 grams are due to the 63 Wh 6-cell battery in the back. This battery lifts up the case by a few millimeters in the back. The measurements of 305 mm x 207 mm x 35 mm and the low weight are a great combination for users who demand mobility. The 28 Wh 3-cell battery (200 g) reduces the net weight further. Even the power adapter (which will not be needed on short trips) weighs a mere 360 grams. 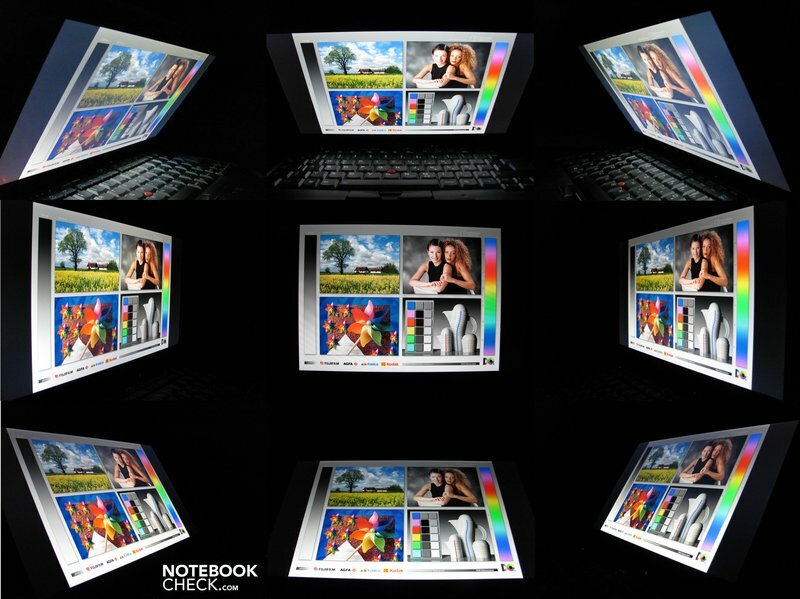 There are a few notebooks which are lighter, such as the Samsung 900X3A (1.36 kg). The Asus P31F weighs quite a bit more with a weight of 1.9 kg, but it is a better deal thanks to its lower price. Standard business ports are a must even for a 12.5 inch notebook like the X220. Lenovo understands this well and, thus, offers two monitor interfaces (Displayport and VGA), a docking port interface, a Kensington lock and a fingerprint reader. These ports will definitely please business users. The laptop also offers three USB 2.0 ports, a combined headphone/microphone interface, a Gigabit-LAN port, an ExpressCard/54 slot and a card reader. A mSata slot is free on the inside of the laptop. The user can install a UMTS card (antennas and SIM slot are both already in place), or a mSATA SSD drive in this empty slot. However, the connectivity has quite a few flaws. Fast ports such as eSata, FireWire or USB 3.0 are not available on our test model. This is disadvantageous for users who require a fast interface for their external hard drives. Only the Core i7 versions of this laptop are equipped with the USB 3.0 port. The situation is further exacerbated by the below-average USB 2.0 performance. The laptop sets a new record for poor performance in our notebook tests with a maximum read rate of 22.8 MB/s. There are very few devices which are slower (for example, tablets, such as Acer”s Iconia W500, or the Android netbook, Toshiba AC100). However, this problem might just be restricted to our test model. A second test model managed to achieve a much better result of 32 MB/s with the BIOS version 1.11. We do not think that the BIOS version is at fault for this poor speed, as we tested the "slower" model with BIOS versions 1.11 to 1.16. The card reader, on the other hand, delivers 19.8 MB/s which is a decent result. Users also have the option of using network hard disks (via Gigabit-LAN - speeds range between 50 - 70 MB/s), or adding additional port by putting adapter into the ExpressCard slot. The use of adapters during mobile use might prove uncomfortable, and during stationary use, a docking station with eSata would be useful. The positioning of a USB port under the ExpressCard slot could be inconvenient. Placing an adapter in the ExpressCard slot will leave barely enough room to connect a USB cable or a USB stick. However, thicker UMTS or DVB-T sticks will not fit into this tiny space. This issue is significant as the yellow USB port placed on the right side has the sleep-and-charge function, and this means that it has a lower current. In our test, a few external USB 2.5 inch storage devices refused to run on that port because of that reason. As such, the ports available for use fall to the two on the left side. We can not understand why the VGA output quality is so poor. We think it is a great idea to place old monitor interfaces, such as VGA, alongside modern interfaces, like HDMI or DisplayPort, as this allows users to use older monitors with their notebook without requiring an adapter. However, for some reason, the notebook does not deliver a good output via the VGA interface. The picture quality is blurry (we used a HP Mini 5101 netbook for comparison) at a resolution of 1280x1024 pixels. The same applies for WSXGA with a resolution of 1680x1050 pixels. Surprisingly the signal is much better and clearer on a full HD screen. However: monitors with a single VGA interface and full HD resolutions are rare to find. ...if an older WWAN module is installed. Our test model is equipped with Intel”s Centrino Advanced 6205 WLAN module, which has two antennas. A Centrino 1000 (also 2 antennas) or a Centrino Ultimate 6300 with 3 antennas (which should offer better performance thanks to the extra antenna) are also available. A 720p webcam is installed for video calling. In addition, an integrated Bluetooth 3.0 module allows users to sync their mobile phone, mouse, or other devices with the X220. UMTS is not installed in our test model. However, this can be easily remedied with a quick, manual installation. 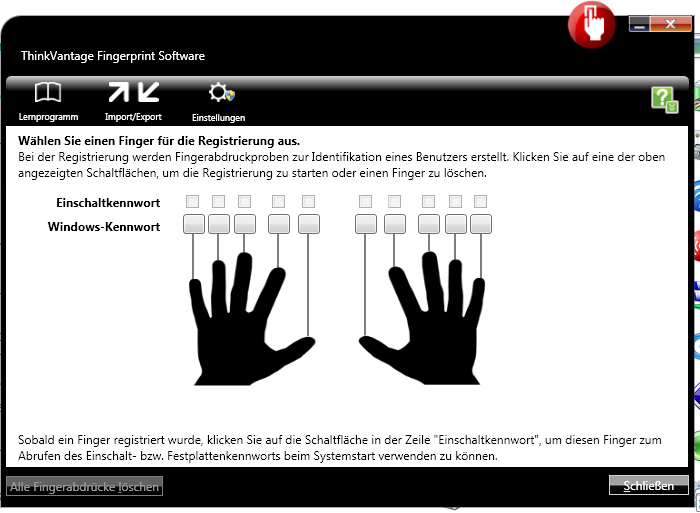 As usual, Lenovo has set up an online picture guide for the X220 which indicates the steps the user will have to follow to reach and install a module in the empty slot ("Hardware Maintenance Manual"). Users who own an older ThinkPad model might decide to swap out the old WWAN module and install it into their new X220. We tried to do just that with an original Lenovo FRU 43Y6513 Ericsson 3507g. However, our experiment was stonewalled when the BIOS refused to accept the old WWAN module. As such, if users desire a UMTS module, they will have to buy the recommended Ericsson F5521gw module (circa 100 Euros). But, the installation of a UMTS module in the empty slot will mean that a mSata SSD can no longer be placed in that slot. If both features are necessary, then we recommend the purchase of a UMTS USB stick or ExpressCard. There are a few different battery models available for the X220 and we will discuss them in more detail in the "Battery Life" section. Lenovo offers an arsenal of accessories for their latest model: ranging from various mouses to hard disks with security codes to a well-equipped docking station. The ThinkPad Mini Dock Plus Series 3 (4338-10U) docking station offers(among other ports): 2xDVI, 2xDisplayPort and eSata. The docking station is available for circa 160 Euros. The entire list of accessories is available on the Lenovo homepage. The warranty lasts all of 36 months (typical for upper-class business notebooks) and it can be extended and customized by contacting Lenovo. 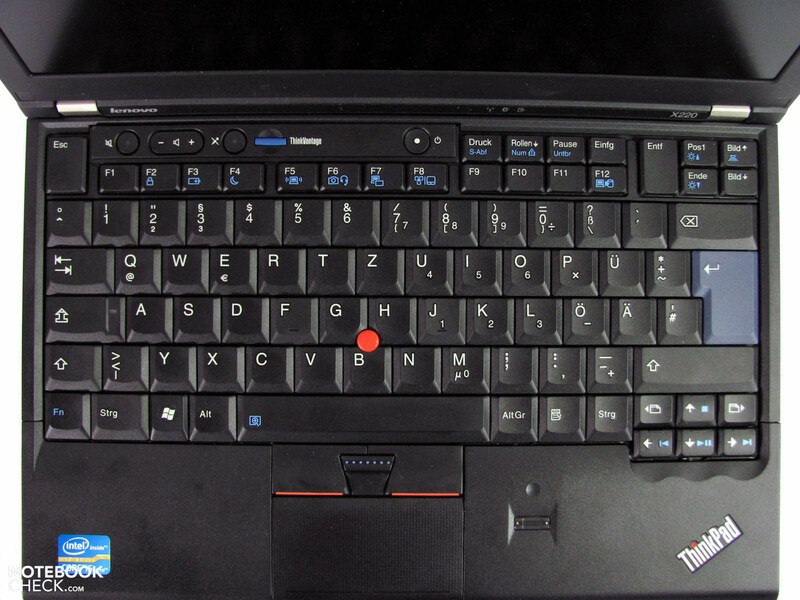 The keyboard of the laptop has the typical ThinkPad look. It has the usual medium length stroke distance with good pressure points and comfortable typing noise. Most keys are well-sized and are easy-to-use. 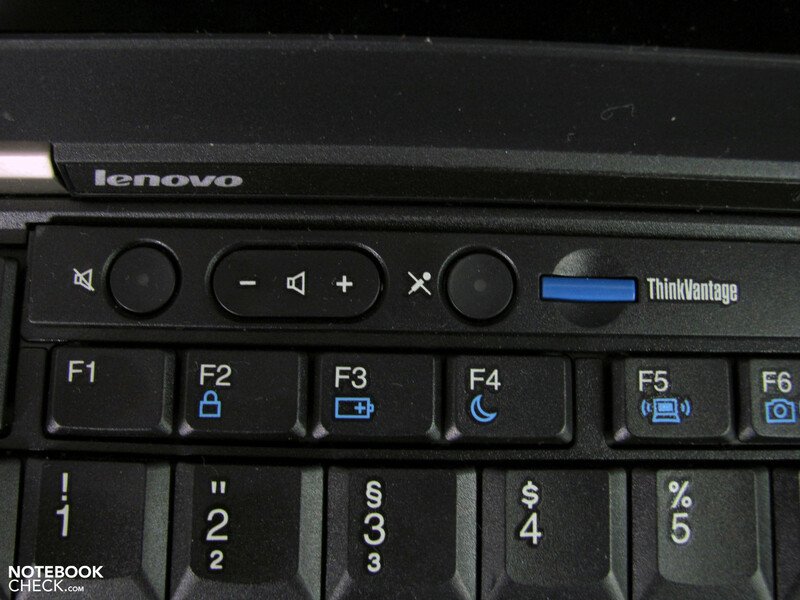 ThinkPad novices will have to get used to the swapped "Fn" and "CTRL" keys on the left side and the pretty far up "Delete" key on the right side. Thankfully, users can swap the "Fn" and "CTRL" keys in the BIOS. In dark rooms, the "ThinkLight", which is placed in the display, can be used to light up the keyboard. The keyboard is overall quite resistant, but the left one-third area can be bent inwards. However, this does not affect the use of the keyboard. The cursor keys are rickety in our test model, as they are not placed properly on the keyboard itself and thus, make loud noises during typing. However, once again, our second test model came to the rescue with a smooth typing feel. As such, we suspect that this is a fault in our first test model. 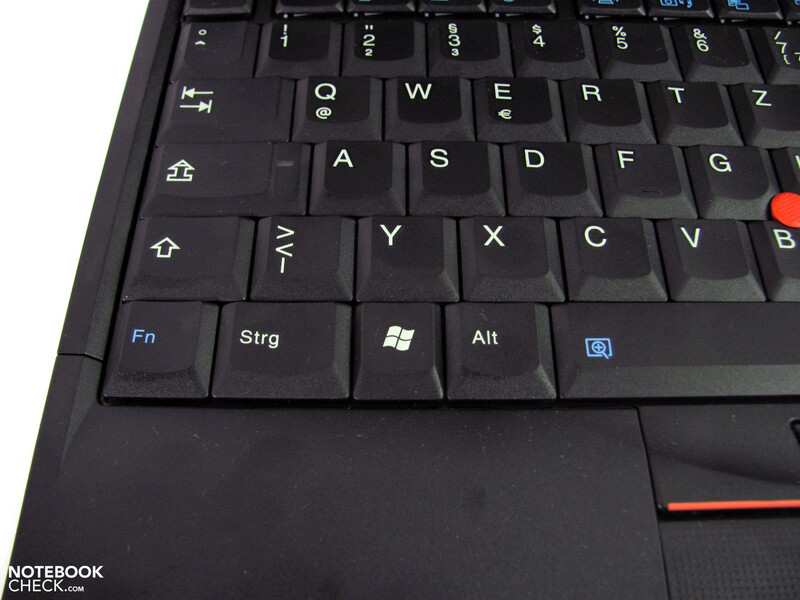 Overall, the keyboard is good for users who need to do a lot of typing and lives up to the ThinkPad standard fully. 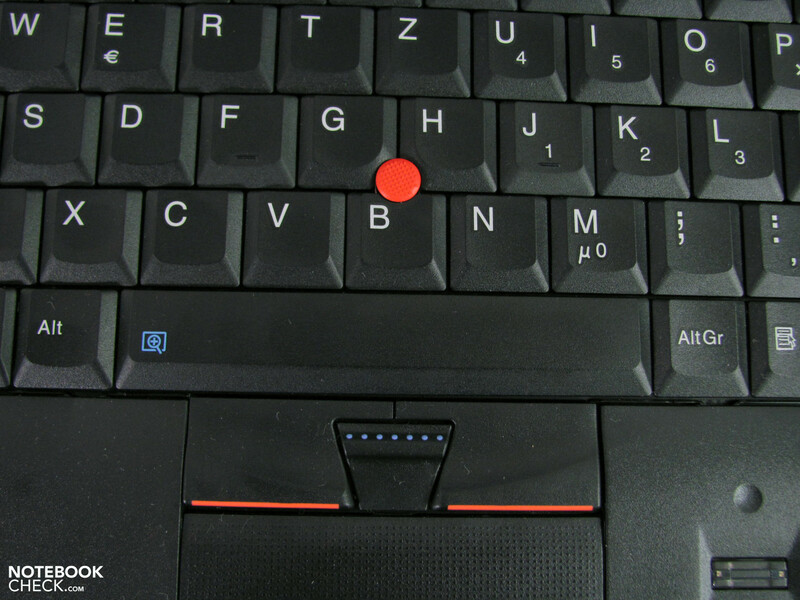 The touchpad of the X220 does not have separate keys, and responds to taps all over the surface. 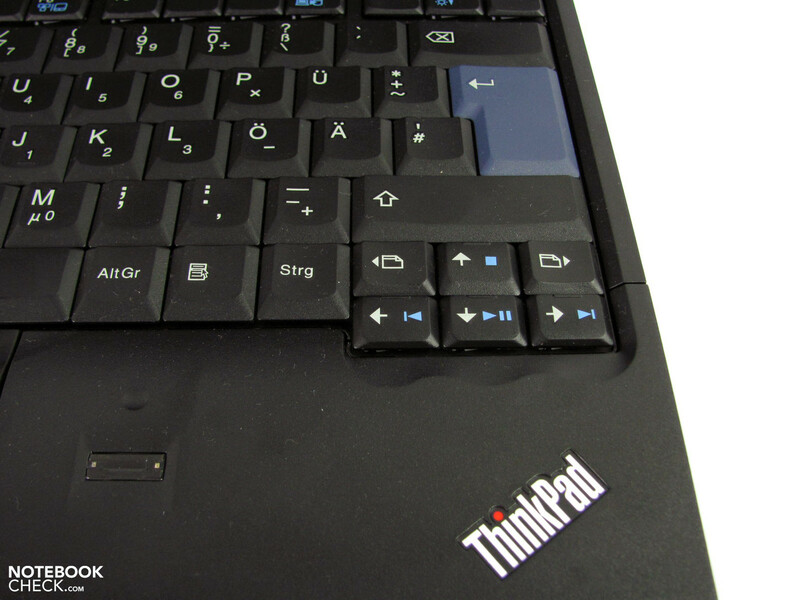 The touchpad responds to the "clicks" well near the bottom edge of the surface, where the keys are usually placed, and poorly near the top edge. The typical functions work well, but multi-finger gestures are not recognized well, and as such bring no joy. The touchpad surface extends up to the front edge of the laptop which can lead to unintentional inputs. Accidental brushes near the front of the laptop can shift the mouse cursor and disturb the work flow. However, "TrackPoint" users will not be bothered by this, as they have the option of switching off the touchpad entirely. The "red knob" makes navigation precise and its input works perfectly. The ThinkPad X220 is available with two different anti-glare LED displays. The previously mentioned HD Premium IPS display and a "conventional" TN display. Both have a resolution of 1366x768 pixels and a screen diagonal of 12.5 inches with a 16:9 ratio. The IPS display has 300 nits and great viewing angles, whereas the TN screen (not tested) delivers standard performance. 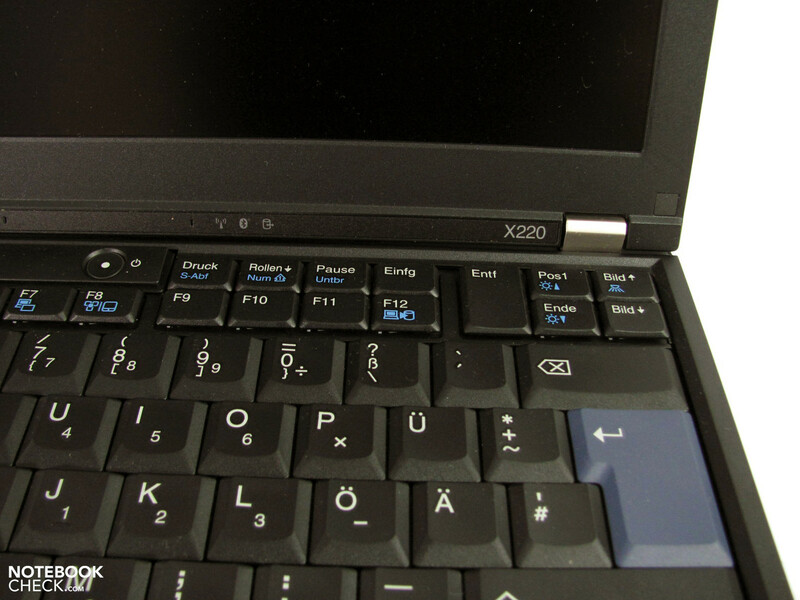 The panel of the X220 is produced by LG Philips and offers a maximum brightness of 265 cd/m². We calculated a great illumination of 93% with an additional 8 points (at which we measured values ranging from 246 cd/m² to 262 cd/m²). 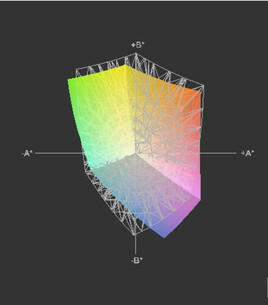 The brightness level can be set at 15 different levels which starts from 4 cd/m² and goes up to 148 cd/m². From this level (level 13), the user can increase the brightness up to the maximum, which is however, just like in the ThinkPad W520, not the brightness level promised by Lenovo (300 nits). Still the result is quite good, and both indoors and outdoors, the maximum brightness level allows the user to work comfortably on the laptop. The good contrast ratio of 842:1 ensures clear legibility of texts and internet sites. 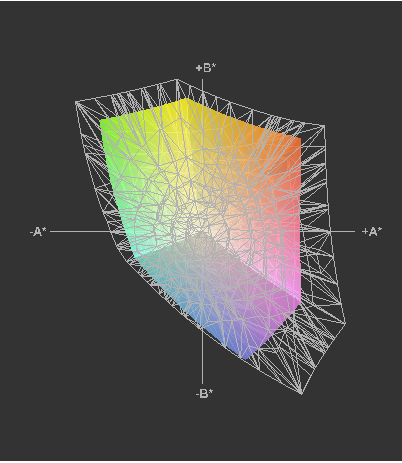 The potential of the display really shines through when viewing pictures, games or movies. The crisp colors and dark black are impressive. The color space covers the typical room and as such does not cover the entire sRGB color space with circa 562000 possible colors (around 67 % of sRGB). Thankfully the viewing angle stability is very good. The picture is easy to recognize from all sides, and the only loss in picture quality due to a shift in the viewing angle is a drop in the brightness level. The colors stay stable and they do not invert into other color spaces like in the ThinkPad W520. This makes the IPS display one of the best displays available for notebooks right now. This great display is available in the Lenovo "Online Shop" for an incredibly low premium - a mere 40 Euros extra. Hopefully, this is the first step on the road to better displays for all laptops. The ThinkPad X220 is equipped with processors from Intel”s latest generation: Sandy Bridge. In comparison to their predecessors, the new CPUs deliver quite a bit more performance, and the mobile Intel QM67 chipset in the laptop can use up to two 2 slots which can hold up to 8 GB. Our test model came equipped with a single 4 GB RAM module, leaving one slot open for an easy upgrade. Adding another 4 GB RAM module is a piece of cake and is also worth recommending because this will allow the laptop to use the RAM modules in "Dual-Channel" mode. The laptop can be equipped with a variety of regular processors (just like the ThinkPad X201), which, unlike their "Low Voltage" and "Ultra Low Voltage" counterparts, deliver more performance. The offered Core i3, Core i5 and Core i7 models cover a wide performance spectrum (i3 models are installed in the X220i); sadly, quad-core CPUs are not available for this model. Our test model came with an Intel Core i5-2520M CPU which has a clock frequency of 2.5 GHz (Turbo Boost can increase the clock speed up to 3.2 GHz). Of course, this CPU also has "Hyperthreading" which allows it to generate two virtual cores (one for each real core), and thus, process up to 4 threads simultaneously. The slightly high "Thermal Design Power" (TDP) of 35 W is acceptable as this includes the power usage of the integrated graphic chip and the memory controller. The graphic performance of the laptop is limited to the power of the integrated Intel HD Graphics 3000. This chip delivers enough performance for most tasks. Dedicated graphic card or other professional graphic solutions are not offered for this model as the laptop lacks the space for them, and even if it had such space, such systems would definitely make the temperature emissions shoot up. The performance delivered by the small notebook is quite respectable. The CPU alone scored 5082 and 10767 points in the Cinebench R10 benchmark (single/multi), and more than 667 seconds in the superPi 32M calcuations, as well as up to 528 seconds in the wPrime200 1024m. All-in-all, this CPU ranks well at number 31 in our in-depth CPU benchmark list. As mentioned before, the graphic performance delivered by the notebook is insufficient for gaming or calculating 3D models. This statement is further supported by scores of 1678 points in the 3D Mark Vantage benchmark and 5135 points in the Cinebench R10 OpenGL Shading benchmark. This performance will not suffice for a high level of details or effects in games. Thankfully, full HD videos play fluidly even at low GPU clock speeds (maximum battery life), thanks to the DXVA-ready player. Intel”s HD 3000 graphics deal with flash videos without a problem too. 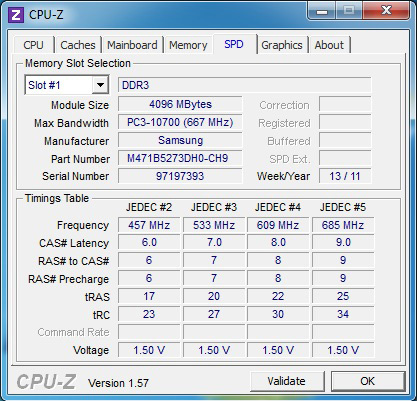 A second RAM module increased the performance of the graphic unit in the benchmark by 10-30% (a significant increase). This increase was mostly thanks to the activated "Dual-Channel" mode (the big RAM storage of 8 GB contributed much less to the increase). This mode improves memory efficiency and thus raises the graphic performance. A specialty of the new Sandy Bridge generation processors is the Quick-Sync Video feature. This is an integrated hardware accelerator which decreases the stress on the CPU during video conversions. 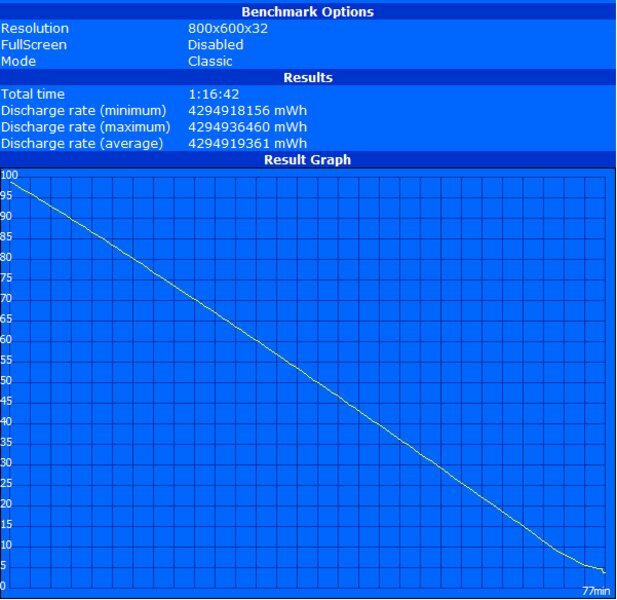 Even Nvidia”s CUDA engine on the Quadro 2000M was beaten by Quick-Sync (in our review of Lenovo ThinkPad W520). We tested the X220 with Badaboom 2 by converting our test video, "Seven", from DVD to MP4 (compatible with iPhone) with a resolution 427x320 pixels. The result of 115 fps (Quick-Sync) might not have been as fast as that of the W520 (225 fps), but all older CUDA systems would have been beaten by it. The CPU load with Quick-Sync was around 51%, whereas without Quick-Sync (only CPU) the load shot above 90% (150 fps). Sadly, such good performance is not always possible. For example, running the laptop without its battery (running with the 65 W power adapter), causes a fall in CPU clock frequency down to 800 MHz. 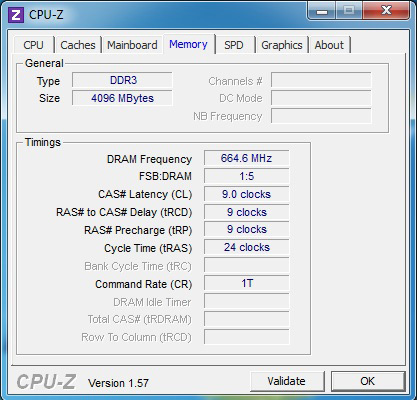 We tried changing the settings in the BIOS and in the energy saving schemes, but the clock speed stayed the same. This issue was resolved when we used the stronger 90 W power adapter from the ThinkPad T61. After that, the CPU could run at maximum speed even without the battery. Throttling is another serious problem which affects the performance. We did not notice any throttling while we were using the single RAM module installed in the laptop by the manufacturer (1 x 4GB). The power adapter exceeded its 65 W power limit only once and usually consumed around 60 Watt. The approximate CPU temperature is no cause for concern at 87°C (recorded using HW32 and TPFancontrol). We ran a few benchmarks (Furmark, Prime95, wPrime200 and Cinebench R10) in different combinations, and the laptop processed them at speeds ranging between 2.5 to 3.2 GHz. The ugly problem of throttling rears its head soon after we add the second 4 GB RAM module. In the HW32, we noticed quite early that the processor speed constantly changed between 3,2 to 2.8 GHz and 2.5 GHz down to 800 MHz. According to the TPFancontrol benchmark, the CPU does not reach high temperatures as in the first scenario. Instead, throttling kicks in around the 68 °C mark. After 10 more minutes, the HW32 benchmark revealed that the CPU clock frequency remained stuck at 800 MHz, and even the temperature drop of 53 °C did not change the situation. Shortly disconnecting the power adapter helps the CPU recover its original speed. The CPU usually throttled at 63 °C, although at maximum speed (3.2 GHz) the throttling took place after the 72 °C mark was reached. After throttling, the laptop remained at 800 MHz for a while. To what extent does this issue affect the user in everyday use? That is a subjective question, and the answer will depend on what programs the buyer uses on a regular basis. We did not notice any fall in performance while converting videos (Badaboom) and music files (iTunes). The X220 is available with conventional hard disks and modern solid state drives. Additionally, the user also has the option of installing a mSata SSD instead of a 3G UMTS module. The possibilities are extensive, especially for a 12.5“ subnotebook. 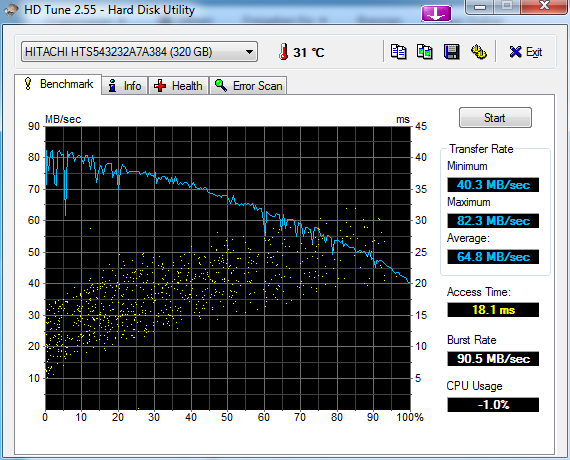 Our test model has a Hitachi hard disk with a capacity of 320 GB (total) and runs at 5400 rpm. 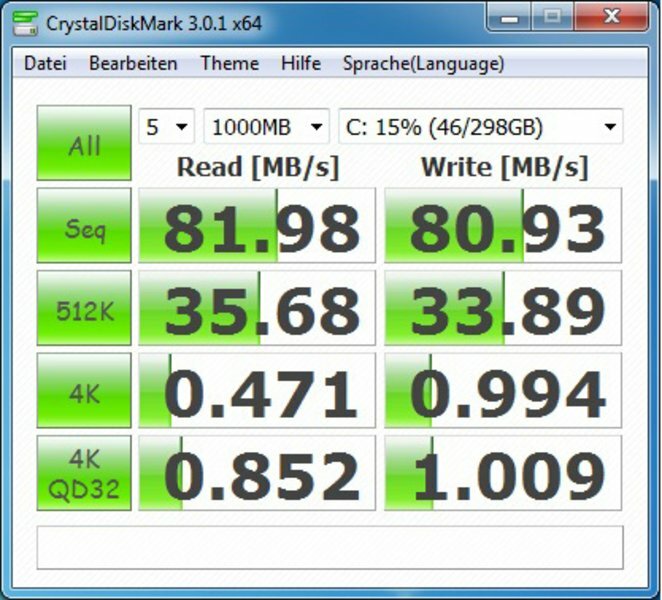 The performance is not mind-blowing (average of 64.8 MB/s), but it is a cheap and decent storage solution. The performance is subjectively much slower than that of a SSD due to the relatively slower access times of 18.1 ms. A SSD performs much faster, delivering a much smoother and better experience, while, for example, opening programs, booting, etc. The storage device can be easily swapped out thanks to its easily accessible panel. Careful! Lenovo uses especially flat 7 mm storage devices for the X220. Two rubber covers are added which reduce the vibration of the device and also increase the total height of the storage device to 9 mm. 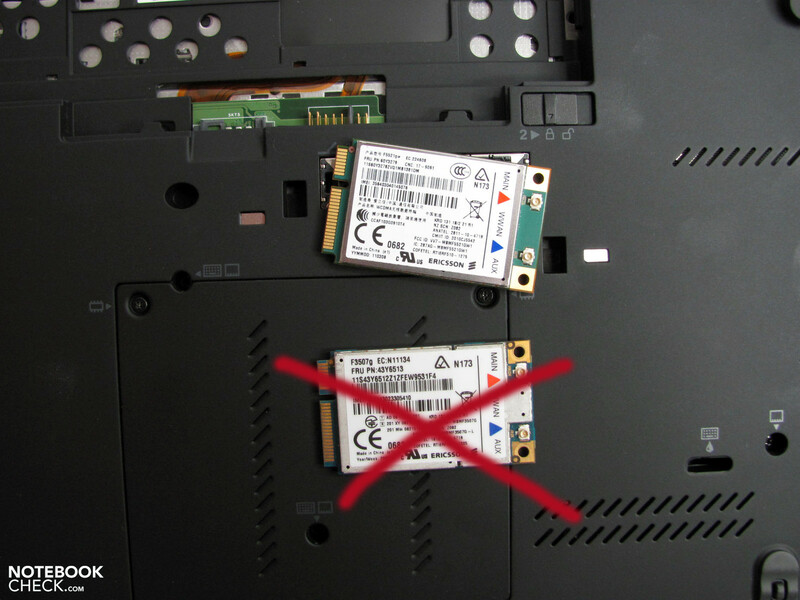 Any bigger drives will not fit into the X220, so, for example, the conventional 9.5 mm hard disks or SSDs can not be installed. 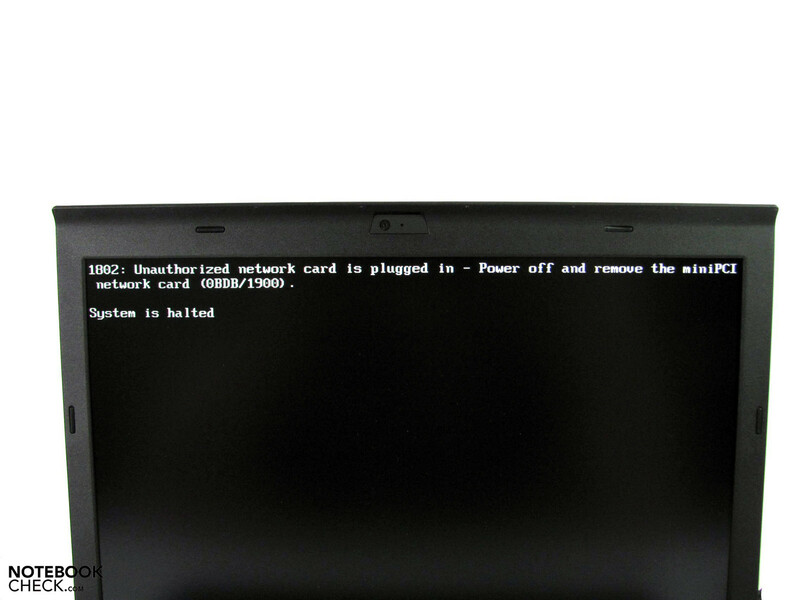 This means that the latest SSDs such as OCZ Vertex 3 or the Intel 510 series are not valid candidates as storage replacements for the ThinkPad X220. 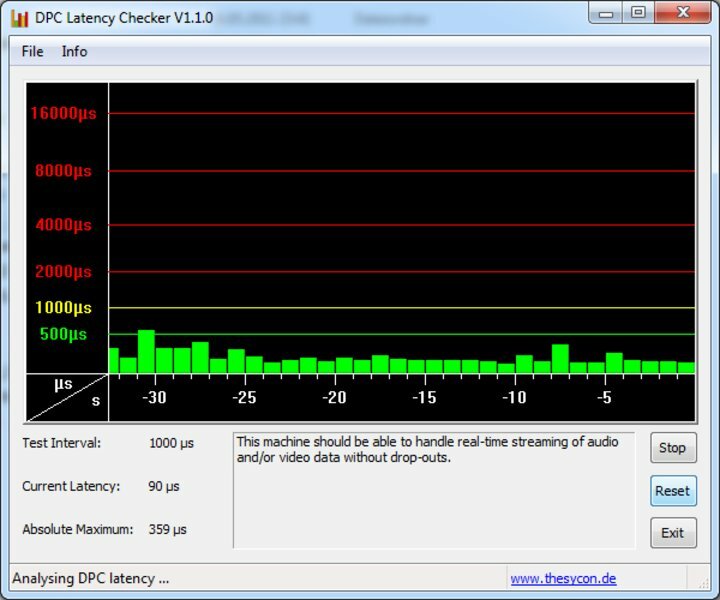 We checked the latency times of the X220 with the DPC Latency Checker tool. 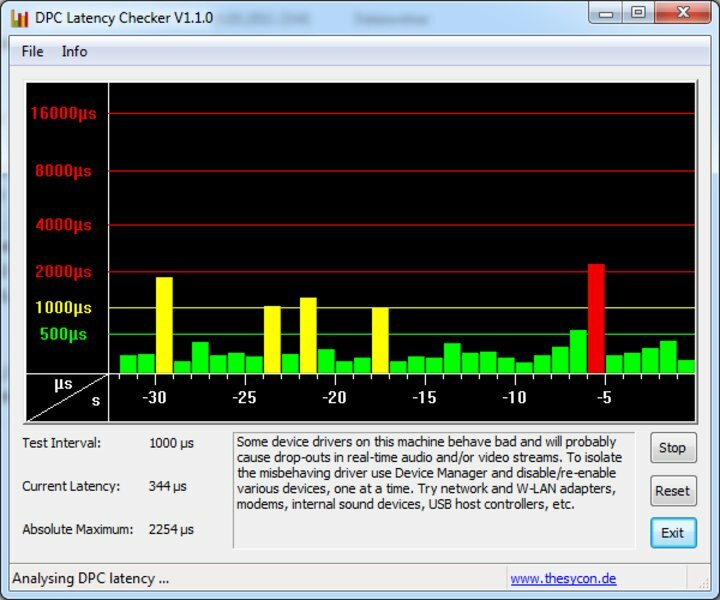 High latency values can lead to synchronization errors with external devices, such as sound cracking up or picture and audio being played out of sync. The first test revealed that the laptop”s latency times went well over the critical 2000µs limit. Switching off the wireless modules, resolved the situation and the values later on in the test remained in the green zone. 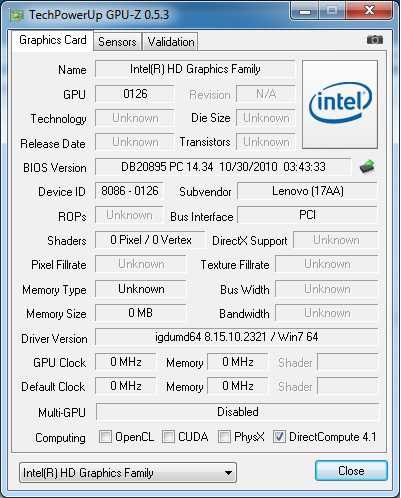 The native display resolution of (1366x768) and low quality settings allowed games such as Racedriver, Sims 3 and Starcraft 2 to run well. With this configuration, the frame rates always lie in the green region and the picture is always fluid. Lower resolutions can further increase the frame rates, but doing so will make the games boring. Higher quality settings will lead to more stutters. A second RAM module might improve performance in this case (not tested). THe loudness of the ThinkPad X220 varies depending on the BIOS version. We used BIOS 1.11 for our measurements. With this version, the cooler fan acted very conservatively, like the fans of the older ThinkPad models. We measured noise emissions between 28.6 dB(A) to a maximum of 38 dB(A) which are very good. The quiet motor noise of the Hitachi hard disk dominates the noise scenery when the fan switches off. When the hard disk switches off, the laptop runs completely silently for a while. The use of a SSD can optimize the noise emissions further. It is possible that the manufacturer changed the cooler fan settings due to the throttling issue in later BIOS versions. We used version 1.15 for a short while and we notice that the cooler fan ran a lot more and that throttling was still an issue. TPFancontrol showed that the cooler fan stayed at level 3 (around 34 dB(A)) most of the time. The cooler fan turns down only when the laptop is completely idle. Otherwise, the user just has to deal with a constant 34 dB(A) fan emission. The TPFancontrol tool proves useful in this case, as it offers a variety of levels at which the cooler fan can be run. 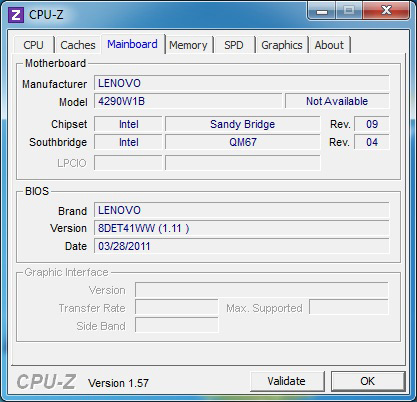 Thankfully, Lenovo has released BIOS version 1.16 which returns to the original cooler fan behavior. In office use or while surfing on the internet, the laptop cooler fan is very quiet at level 1 which is barely audible. A sudden increase or decrease of the fan speed or high noise emissions were not noticeable in our test. The case can reach a maximum of 39.7 to 43.2 °C under load. This is a noticeable increase in temperature but it will not be a problem as usually 3D calculations or rendering are not done with notebook on the lap. During normal use the temperature is around 10 °C lower at a maximum of 28.5 to 31.2 °C. The quality of the integrated speakers is standard as in most notebooks. There are too many highs, very few middles and little bass which means that the sound output will not make music enthusiasts jump with joy. Head phones or USB speakers should be included for mobile use if the user wishes a decent sound output. The different battery models available for the X220 are guaranteed to give the user a great degree of flexibility. The small 3-cell battery with a 28 Wh capacity (0A36281) is the lightest of all the models. The 6-cell battery with a 63 Wh capacity (0A36282 - in our delivery), offers a good compromise between battery life and weight. Longer run times are possible with the 9-cell battery (0A36283 - capacity of 100 Wh) which when combined with the docking 6-cell battery (0A36280 - capacity of 64 Wh) should deliver the maximum 23 hours run time (according to Lenovo”s webpage). The power usage (measured from the power adapter) ranged between 5.7 to 65.1 W. The ThinkPad X220”s frugal power consumption is a great basis for long run times. Does the battery make the best of this design? In the Battery Eater Readers test (longest possible run time - wireless modules off, minimum brightness, energy-saving mode), the X220 ran for slightly more than 9 hours, which means that the power usage per hour was around 7 Wh. 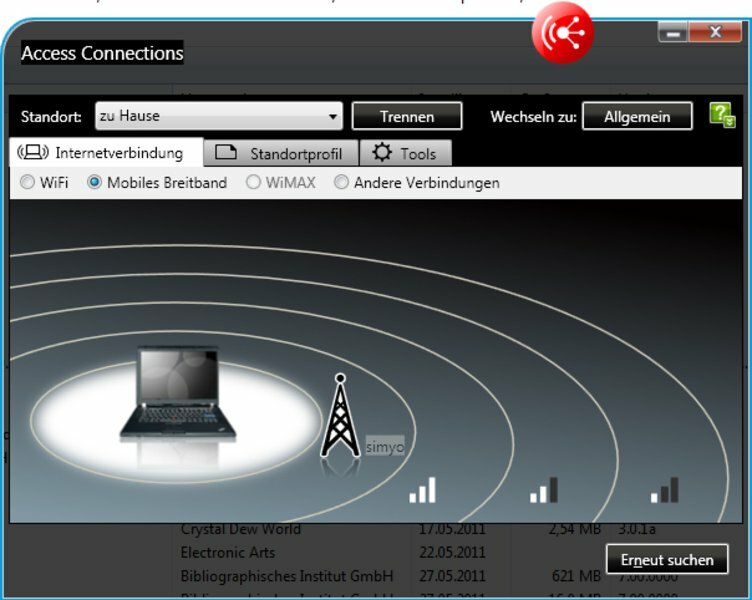 Surfing using the W-LAN module (brightness level 14) and watching films (max. brightness) were also not a problem for the laptop: 368 and 352 minutes respectively. The Battery Eater Classic test (everything on, maximum performance, maximum brightness) exhausted the laptop battery within 77 minutes. We also tested the laptop as a make-shift "iPod" (display off, iTunes playing in "Shuffle" mode), and as a television (Elgato Tivizen, W-LAN DVB-T, maximum brightness). For these tasks the battery could deliver good run times of 536 minutes and 243 minutes respectively. 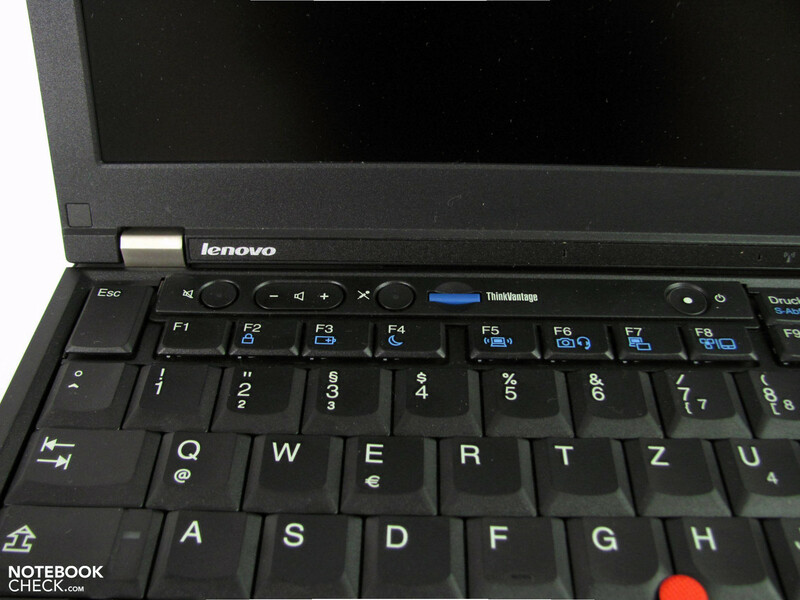 The Lenovo ThinkPad X220 may not be perfect, but it is a well-designed laptop with the typical ThinkPad "flair". The notebook offers good mobility and the latest hardware - a combination hard to resist. So we can safely say that the Lenovo ThinkPad X220 is an attractive deal. The sturdy case proves resistant in many areas but it is not perfect. The material weakness does not impact the sturdiness of the case too much, but the bulging of the material in the display border when the laptop heats up in direct sunlight will leave a negative impression on users. The performance is similarly double-edged. 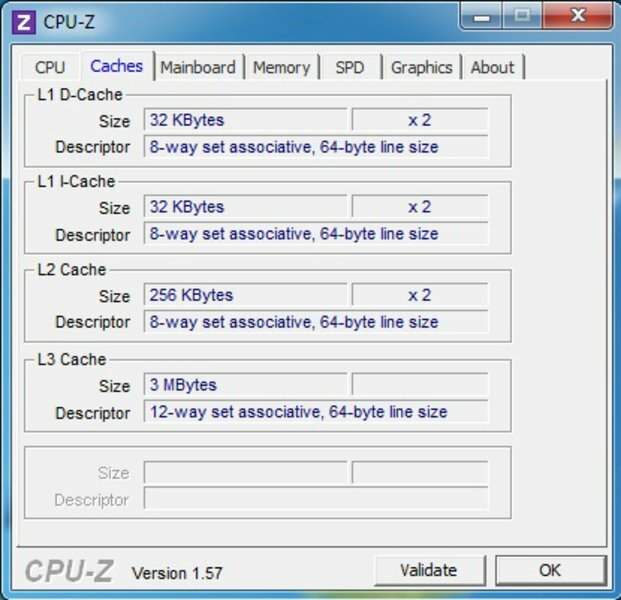 The high CPU performance will suffice for most tasks and the new Quick-Sync Video feature will allow the user to do more than before. However, if the laptop is under heavy CPU load for a long time then CPU throttling becomes an issue. This will drop the performance of the notebook severely. The situation is made worse by the fact that the laptop can only operate at the base clock speed when the battery is removed and the laptop is running via the power adapter. The connectivity is good, but the positioning could have been better. The modest VGA output quality and missing ports such as USB 3.0 (only available with the i7 models) are two more flaws which should be dealt with in future models. The emissions leave very little room for critique. 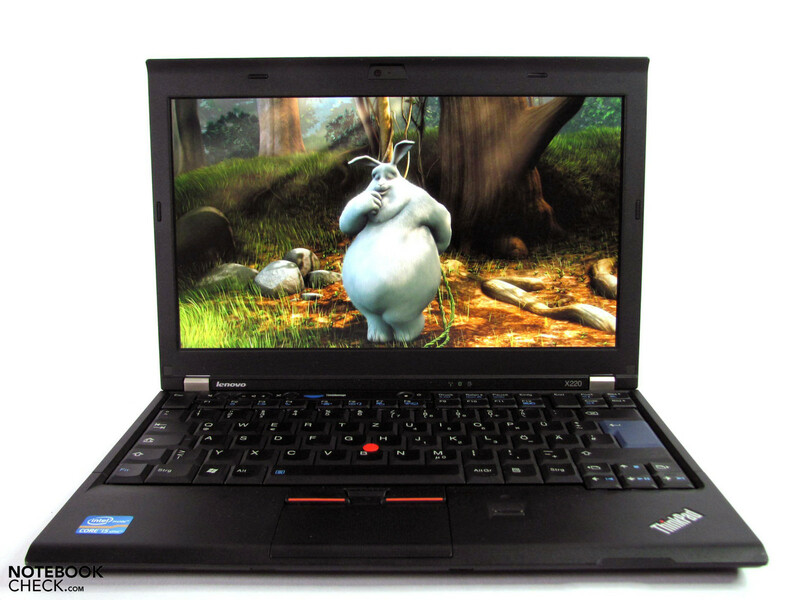 The ThinkPad X220 operates quietly, and even under heavy load, the emissions stay in a comfortable region. Another plus is that the emissions do not heat up the case uncomfortably. The battery life ranges between 1 hour and 9 hours. 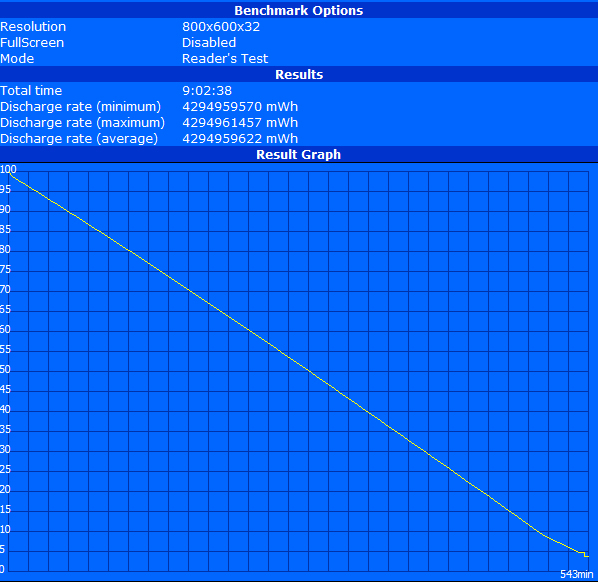 In everyday use (with a 6-cell 63 Wh battery) the laptop should run between 4 to 6 hours comfortably. Finally, we commend Lenovo for its great HD Premium display (IPS panel). The values of the display are far above that of an average panel. So, brightness, contrast ratio and viewing angle stability are all great, and combined with the anti-glare coating, the screen can display materials better than most other laptops can.